Hey everyone, we have reviewed the comments on the tutorial and have decided to accept homework submissions until the 27 of October at 11:59PM CEST. We will be accepting homeworks until the end of Friday. Be warned, the homework link will not be changed, and thus when you click on the homework submission link you will still see the old deadline. We hope this gives you time to submit some really awesome homeworks! I really love that you reply very fast and try to help us. Thank you for that. Unfortunately I couldn’t fix my problem and still don’t know what to do. Everything working so far? Tell me if you had any problems with the setup or the workflow in general. Feedback is always appreciated! Appreciate your comment Can you tell me exactly what you are struggling with? Was it simply the merging process that did not work for you or anything else? I have managed to complete the post processing. Found something very peculiar on the FW surface, tiny dots in lower pressure colours. Could you explain why/what I am seeing. Its visible in the 2nd to last screenshot. I merged the components with the script you gave us in the tutorial. There was no problem. Then I loaded the merged car up and created a mesh. The meshing process proceeded successfully. After that I tried to start the simulation there was that error. Hi @nishank_a! Might be a glitch from the viewer and nothing related to the numerics. Can you share the project with me to have a closer look at it? Thanks! Can you share the project with me? Having a look at it! Hi, how do I get the wing in position? Hello, I’m having a lot of trouble importing the car file into SolidWorks, how did you do that? Here is a link to the project : https://www.simscale.com/workbench/?pid=3722537015057165552 can you take a look at the result ? 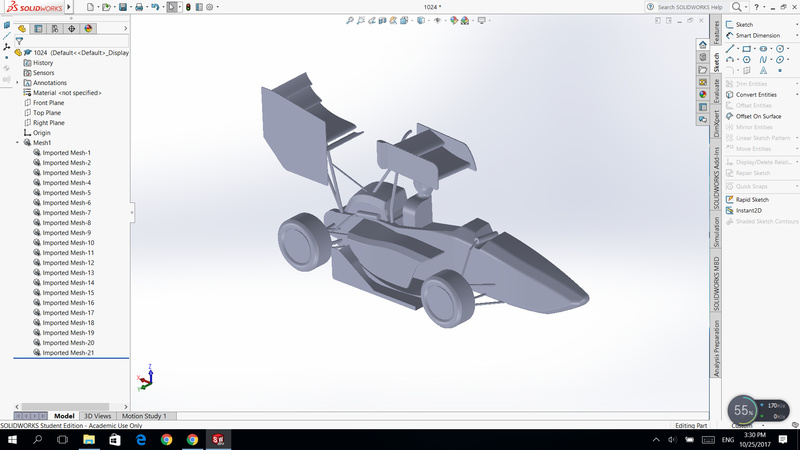 Move both parts(front wing and the car)into assembly align the front wing with the nose and export the assembly to simscale. Everything went OK after my little issue. I have postprocessed the simulation and it seems a good starting line for future designs. Hi @jousefm I have designed the front wing but I am still facing a problem in positioning the front wing with the given model. Can I share the solidworks part file with you so that you can help me out? Have you tried ticking off the option “Do not translate STL output data to positive space” when exporting the file? Hey, I uploaded my homework on Wed as I thought deadline was extended in cause of Simscale problems. But I did not get any mails about deadline extension or course completion. Is it ok or my work had not been approved? The deadline was 27th of October at 11:59PM CEST. So you should be fine - will still ask if your homework and you will get a notification in any case.